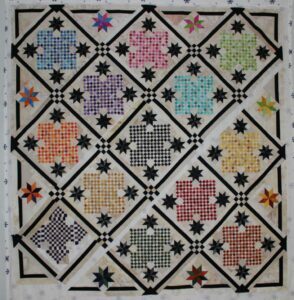 Your quilt will is very nice, but the bottom left end corner block does not macth the other blocks. The final block will look much nicer once it is finished. Thank you for stopping by. This is coming along beautifully, and I love the blocks. How small are the squares? I love how colorful it is, and the black ties it nicely together. 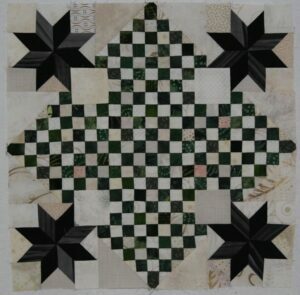 The checkerboard squares finished in the quilt are 5/8″. 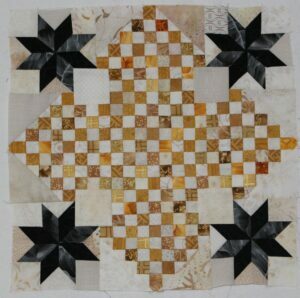 I cut neutral & colored strips 1 1/8″ wide, sewed them together and then subcut the strips. It has been a challenging, but very rewarding project.